Yogi Adityanath, the firebrand leader of the Bharatiya Janata Party (BJP), took the road to West Bengal from BJP-ruled Jharkhand to address a massive gathering of supporters after the Banerjee government denied him permission to address rallies. Uttar Pradesh Chief Minister Yogi Adityanath on Tuesday assailed West Bengal Chief Minister Mamata Banerjee from West Bengal’s Purulia, mere days after he was denied permission to land in the state. Adityanath, the firebrand leader of the Bharatiya Janata Party (BJP), took the road to West Bengal from BJP-ruled Jharkhand to address a massive gathering of supporters in the western part of the state where a showdown between the government and the CBI is over the Kolkata Police commissioner. 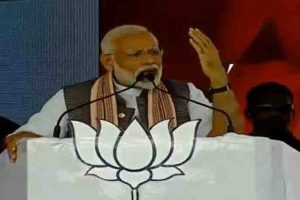 “This (West Bengal) government is embroiled in undemocratic and unconstitutional activities and that is the reason why a ‘sanyasi’ and ‘yogi’ like me is not being allowed to step on the soil of Bengal,” he said referring to the Banerjee government’s decision to not allow his chopper to land. 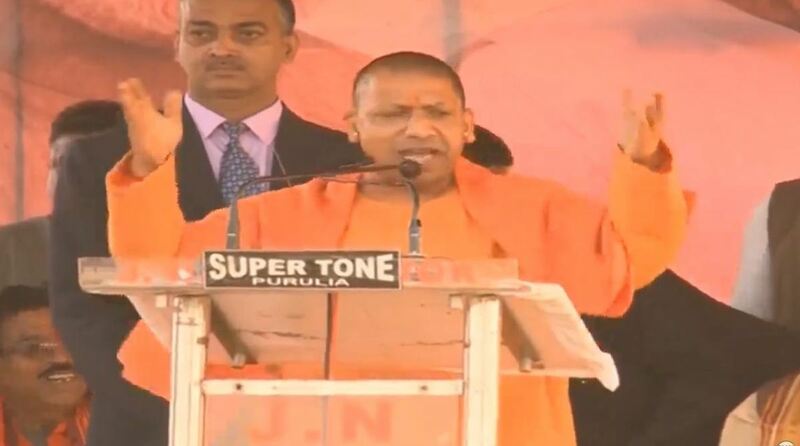 Following the denial of permission to land his chopper on Sunday, Adityanath decided not to attend either of the rallies and instead addressed them over phone. “You can see how Mamata Banerjee is trying to protect a corrupt police officer. This cannot be the conduct of any CM,” Adityanath thundered today from the dais at Purulia. Accusing the government led by Banerjee of acting against Hindu religious festivals, the UP CM told the gathering how the TMC tried to create hindrances with Durga Puja immersions. “Mamata government tried to create roadblocks for Durga Pooja immersions. Sometimes Saraswati Puja, sometimes Durga Puja, sometimes Janmashthami – this state government keeps creating obstacles,” he added. “This is the same Bengal which gave Rabindranath Tagore to the nation, who penned the national anthem. This is the land of (founder of Bharatiya Jana Sangh) Shyama Prasad Mookerjee. This land of Bengal is a land of pride,” Adityanath said. Congratulating BJP workers for fighting against the “oppressive, undemocratic government” in West Bengal, Adityanath alleged that the money meant for the poor that comes from the Centre does not reaches the people because of TMC. “The way BJP workers and those of other parties were brutally killed in Panchayat elections in Bengal. A government that is involved in unconstitutional acts has no right to remain in power,” Adityanath said. “TMC leaders corner the funds that come from the Centre for Bengal. This is why the poor do not get gas, electricity or food,” he said. Banerjee is on a sit-in since Sunday night ever since the CBI tried to question Commissioner Rajeev Kumar in connection with ponzi scam investigations.